Hello, buddies. Looking for healthy breakfast recipes, are we? Today I am making an addition to the existing list of healthy and quick breakfast recipes. It’s a sandwich recipe. It’s nutritious because it has eggs in it. The health quotient just went up when I added a few raw veggies. And then I added fruit too. Now this isn’t something you do very often. Adding fruit to the sandwich not only enhanced its goodness, but also pumped up the flavors. So you must be wondering what fruit I must have added to my delicious egg sandwich? It’s not the boring apple or the overly sweet mango. It’s the very zingy and juicy pineapple! Pineapple and egg are a heavenly combination indeed. You got to try this one! So I used two eggs for a sandwich. It is a combination of scrumptious omelette and gooey-centered half fried egg. If I had used just omelette, then I would not have gotten the gooey yolk. 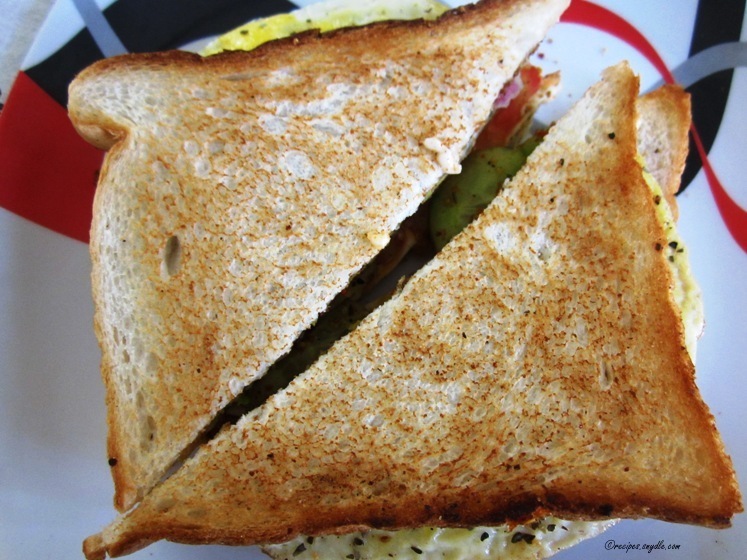 If I had used only half fried egg, the sandwich would have tasted very bland around the corners. So to get the best of both worlds, I used omelette as well as half fried egg. I went all Italian today by using the pizza mix to season the sandwich along with my usual sandwich masala. If you do not have pizza mix, you can use a pinch of garlic powder, onion powder and Italian herbs like oregano and basil because that’s what the pizza mix basically made from. Always remember, the key to a great sandwich is toasting the bread slices on both sides and not just the outside. Using a thin coat of butter to toast the bread will give you amazing results. If you are watching your waist, simply roast the bread slices using some olive oil. The heat of the toasted bread will also help the cheese to melt really well. This is the time to bring your coordinating skills to action. You will be preparing the egg in the skillet on one hand and toasting the bread on the other. 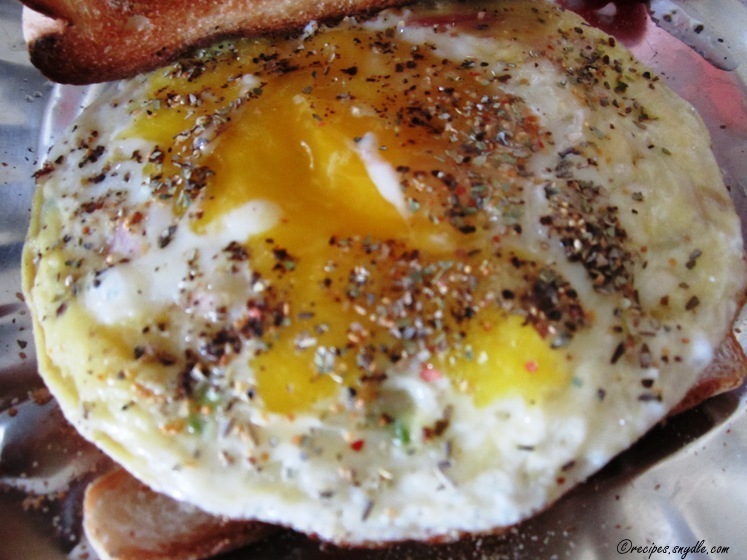 Using the skillet to make eggs will give you a nice and shapely egg. I used the usual aluminum skillet for I like the texture of eggs cooked in it better. But you can certainly use your non-stick skillet as well. Since this is a very detailed recipe for your easy understanding, please do not assume that it is a lot of work because it is really not. 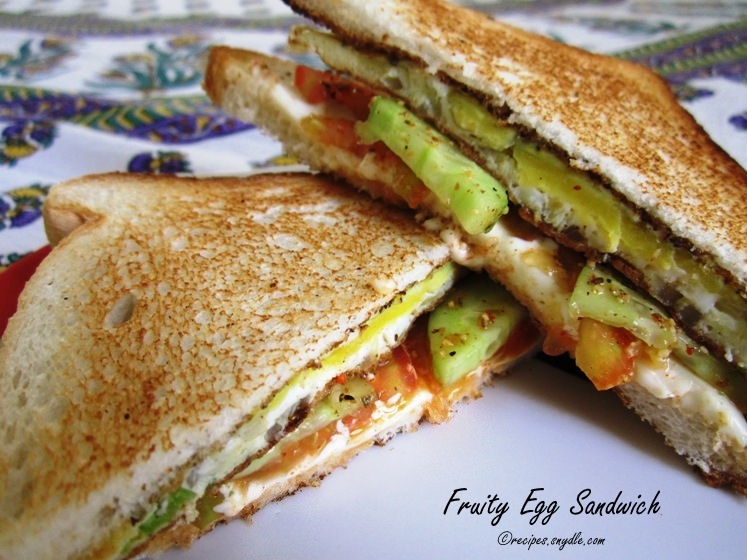 Let’s get started with the recipe of this fruitilicious and eggilicious sandwich. This is a recipe for 2 sandwiches. You can increase the recipe proportionately depending upon the number of sandwiches you wish to make. 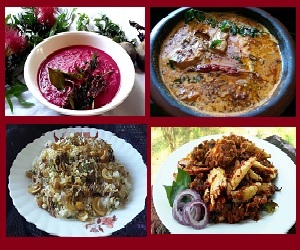 Mix together the salt, paprika and chat masala in a small bowl to make the sandwich masala. Keep it aside for later use. Out of the 4 eggs, break tow of them in a bowl and whisk them. Add in the salt, black pepper, chopped onion, green chilies and minced garlic and whisk again. Our omelette mix is ready. Heat a griddle on the medium-low flame. Butter the 2 bread slices and toast them buttered side down. Simultaneously, heat the skillet. Add in 1 tsp of olive oil and 1/2 tsp of butter and allow it to heat. Add in half the omelette mixture and allow it to cook for 2 minutes till it sets and its bottom is golden brown. Now break the other egg over the partially cooked omelette to make a half-fry on it. Season it with salt, black pepper and pizza mix. Cover the skillet with a lid and allow the eggs to cook for 2 more minutes on low flame. The omelette was already set. The white of the half-fry should set well too. The yolk should be cooked yet runny or gooey, whichever way you like it. The runny yolk, just the way it should be! The bread slices must have gotten nicely toasted on one side. Place the prepared eggs on the toasted side of one slice. Place tomato slices and cucumbers over it. I placed 4 tomato slices and 6 -8 cucumber slices. You can place as many or as less as you like. Sprinkle the sandwich masala and grated parmesan on the veggies. Place a pineapple slice over the veggies and sprinkle some more sandwich masala. Place a cheese slice and pack the sandwich with another bread slice, toasted side in. Toast the sandwich well for a minute or two so that the outer side of the bread slices is crispy and the cheese melts well. Don’t toast it for very long or the egg yolk will dry up. The delicious egg sandwich is ready. Prepare the remaining sandwiches in the same fashion. Cut it into two triangles and serve immediately. 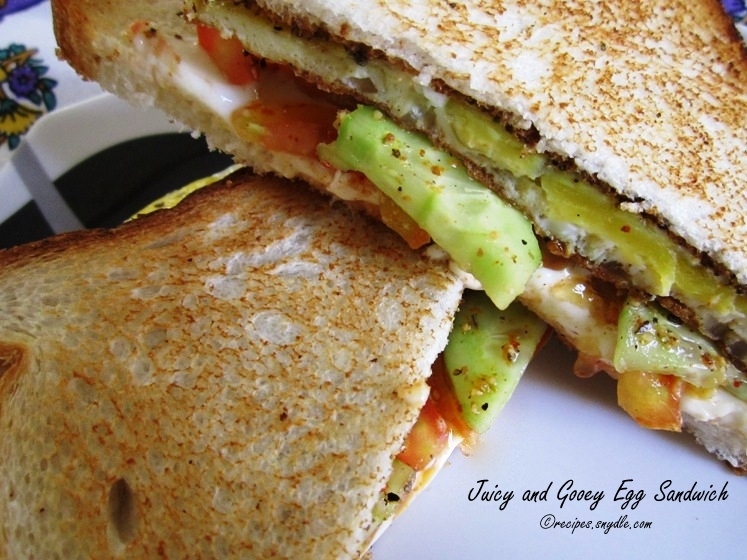 Enjoy the love fruity egg sandwich hot!